In 1999 nearly 100 people showed up at the Hollywood Forever Cemetery to visit the grave of the silent-screen heartthrob Rudolf Valentino on the seventy-third anniversary of his death. When the victim of acute peritonitis was buried at age thirty-one in 1926, 80,000 people showed up for the funeral. A pandemic of mass hysteria followed; dozens of women committed suicide. In 1997 some 50,000 people gathered in Memphis to observe the twentieth anniversary of the death of Elvis Presley. The all-night candlelight vigil occurred during the same month that Britain's Lady Diana, Princess of Wales, died in a Paris automobile accident; her death engendered more column inches in Britain's largest newspapers than the most dramatic stages of World War II. Her funeral, broadcast to 180 countries, attracted history's largest television audience. What accounts for the magnitude and emotional reactions to celebrity deaths? Does it involve some identification the public has with these individuals, or does the surfeit of mass-media attention create its own audience? Being unconsciously imitative, do we cry because mass mediums overwhelm us with images of weeping family and friends? Because grief involves some form of loss, it is necessary to begin with the connections individuals have with celebrities. The essence of celebrity involves the focusing of public attention on select individuals. These recipients may be heroes who embody society's notion of goodness or villains who embody its notion of evil—for example, John Wilkes Booth, Adolf Hitler, or serial killer Ted Bundy. Or they may, like game show hosts or publicized socialites, be simply "well-known for [their] well-knowingness" (Boorstin 1962, p. 57). Such attention giving often does not end with death and, in fact, may even be enhanced, as evidenced by the post-mortem attention given to such rock stars as Buddy Holly and Ritchie Valens. 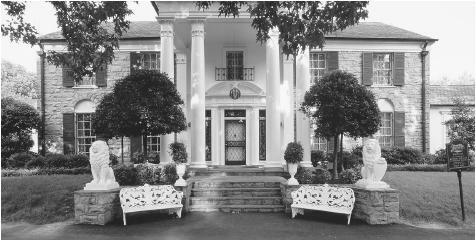 Graceland in Memphis, Tennessee, was the home of celebrity Elvis Presley for 20 years until his death in 1977. It is now one of the most popular tourist attractions in the United States, visited by thousands each year on the anniversary of Presley's death. noted, "As each new medium of fame appears, the human image it conveys is intensified and the number of individuals celebrated expands" (1986, p. 4). The ubiquity of mass-media images creates familiarity with such persons, forming novel attachments and identifications between them and the general public. The rise of celebrity also corresponds with a public increasingly devoid of total relationships with others, individuals' connectedness with others and the broader society dampened by the anonymity of urban life, reduced civic involvements, increasing rates of singlehood and living alone, and by the instrumental relationships demanded by the workplace and marketplace. Further amplifying appetites for celebrities' stories is the new personality type populating the social landscape, characterized by sociologist David Riesman as being "other-directed," relying on others to define one's own lifestyles and beliefs— particularly those publicly identified as living more interesting, glamorous, or important lives. Thus the public may know more about the celebrities' stories than they do of those of their neighbors and associates. The grief over the death of a national leader can be understood in terms of feelings of loss of some father figure or of the symbol of a people. Broadly shared emotions produce a sense of community. Political regimes have long understood this and have capitalized on the power of state funerals as a mechanism by which to enhance social solidarities and to reaffirm the legitimacy of the power structure. But the grief over celebrities like Valentino or James Dean (a screen idol of the early 1950s) is another matter. Here the sense of loss is more like that of a friend because these are not so much role models as reflections of who we are or who we want to be. These are individuals whom one has paid to see or who have been frequent televised "guests" in one's home. People identify with their artists, whose gift, in part, is their ability to capture mass longings in art. Such individuals are generational totems, reflecting the identities and ideals of those who share their age. People grow old with them and project their own hopes and fears on to them. They imagine what they would do with virtually limitless resources if placed in similar circumstances. And when celebrities die so does a portion of their admirers; hence the appearance of the SuperNova card company, which markets thousands of celebrity condolence cards. With the rise of celebrity tabloids, people are able to get even closer to the everyday lives of their favorite celebrities. There is an attraction to those whose private lives increasingly overlap with their public images, revealing ordinary human chinks in the armor of idolatry. And, in a curious twist of the economics of adulation, their mystique increases in proportion to the privacy they seek, as was the case with Charles Lindbergh, Greta Garbo, and Jackie Kennedy. In a society where, as Philippe Ariès observed, death is a cultural taboo and where most deaths occur hidden away in institutional settings, Americans' death knowledge is increasingly learned secondhand from the mass media. The styles in which celebrities die and grieve are matters of considerable interest. From the tabloids people learned of Jackie Kennedy's stoicism following the assassination of her first husband, and of her own efforts to die with dignity a quarter century later. With rapt attention they followed the death trajectories and good-byes of Michael Landon, Frank Sinatra, and Jimmy Stewart. Not only do the deaths of actors become "news," but so do the "deaths" of the characters they portray. On television, for instance, the demise of phased-out characters is a well-established tactic for enhancing ratings, such as Lt. Col. Henry Blake (McLean Stevenson) from M.A.S.H. or Bobby Ewing (Michael Duffy) from Dallas. The more grisly the celebrities' demise, the more morbid the curiosities aroused, a syndrome that produces a lucrative market for death-scene mementos. When the body of the Lindbergh son was found two months after being kidnapped in 1932, reporters entered the morgue and broke into his casket to photograph the mangled remains. Prints were sold on the streets of New Jersey for five dollars each. A reported $5,000 was paid by the National Enquirer for the morgue photograph of John Lennon's corpse. In 1994 Post Mortem Arts was selling copies of Kurt Cobain's death certificate for twenty-five dollars. And in Los Angeles, during the 1990s, Graveline Tours transported curious fans in a classic hearse to view the places where stars were murdered, committed suicide, or were laid to rest. In addition to their growing control over the traffic of death symbolizations, the media have expanded the traditional ability of the arts to confer immortality on their creators and performers. Because of film, for instance, one can still see and listen to Thomas Edison and George Bernard Shaw, men who were teenagers during the U.S. Civil War. And as the power of celebrity is transferred in endorsements, so too can it transcend death. A great-great-great grandfather is remembered because he served with Ulysses S. Grant; the other great-great-greats who had no such associations are typically forgotten. This logic entered the decision of an Austrian novelty firm to approach Mick Jagger in 1988 for permission to market his cremated remains in million-dollar hourglasses. A final cause of interest in celebrity deaths entails the perverse satisfaction in outliving such august personages, a feeling enhancing one's own illusions of personal immortality. The motivation for producing such books as They Went That-AWay: How the Famous, the Infamous, and the Great Died clearly caters to such needs for identification rather than to any authentic personal grief. In the death-denying United States there is a search for cultural scripts for the dying—guides to dying well. There is a fascination with the premature deaths of immortals (or their relations) fueled by Hollywood and the press. The degree of public mourning following the deaths of Lady Diana and John F. Kennedy Jr. led social observers to wonder if grief is an ever-present latent feeling just waiting to be exploited by the political elite, if people's lives are so empty that they engage in recreational grief, or whether empathic fusings of self with certain celebrities can be so great that the grief is as authentic as that experienced with the loss of a family member. Perhaps individuals are emotive puppets manipulated by the mass media and/or political elite, and people cry because they are shown other people crying for a celebrity. In the case of JFK Jr. the grief was not for the man, whose accomplishments were quite modest when compared to his father and whose death was blamed on his own poor judgment, but rather for the young boy saluting the funeral cortege of his slain father. Public mourning was extensively orchestrated. The president authorized the use of a naval warship to conduct his burial at sea, even though Kennedy had never served in the military. Hours of prime television time were devoted to long-distance camera shots of grieving family members and of the vessel from which his ashes were scattered. The untimeliness of a celebrity's demise cannot only provoke extreme adulation for the deceased but also enhance his or her prospects for cultural immortality. In sports and the performing arts, death comes disproportionately prematurely. From 1940 to the present, there have emerged about 300 entertainers whose names could be recognized easily by many people. Over thirty of them died early and tragic deaths—a proportion about three times that of famous politicians or sports celebrities. Writers have proved to be a suicide-prone lot, with notables such as Sylvia Plath, Anne Sexton, and Ernest Hemingway exemplifying research by the psychiatrist Kay Jaimison that shows that writers are ten to twenty times as likely as others to suffer manic depression or depressive illnesses. The immortal cultural status of these celebrities who died prematurely is reflected by the fact that, like the Catholic Saints their memories are honored on their death days and not birthdays. Dying young, these celebrities remain frozen in time and never have to grow old like those who followed their lives. On the other hand, when death comes with forewarning, such as in old age or due to cancer, other machinery of celebrity canonization comes into play. Attention increases in a cultural deathwatch. Final performances hit paydirt as swan songs, even the mediocre ones, such as the concluding films of Gary Cooper and Steve McQueen. Lifetime achievement awards are given, and amends are made for past oversights. Henry Fonda had to wait until he was on his deathbed to receive an Oscar for his final role in On Golden Pond. Celebrity death generates its own pattern of economics. Because the deceased celebrity will not create anymore performances or sign anymore autographs, whatever artifacts he or she leaves behind become more valuable. In the year following his death, Mickey Mantle's used bats, balls, and uniforms increased 25 to 100 percent in value. There are, in addition, the unreleased and incomplete works that may have been left behind. Posthumous books and records have proved to be lucrative business; for example, the dozen years following the death of the novelist Vladimir Nabokov in 1977 saw the publication of ten of his previously unpublished manuscripts. With new technologies, however, dead celebrities were put to work during the last decade of the twentieth century. Natalie Cole recorded a song with her long-dead father Nat; the deceased Frank Sinatra was nominated for a 2001 Grammy with Celine Dion, who performed a duet with his posthumously generated voice; and the surviving Beatles reunited with the voice of the late John Lennon to play "Free As a Bird" and "Real Love." Madison Avenue discovered that the dead make excellent spokespersons, because they never will embarrass the sponsor. In 1994 Babe Ruth was receiving 100 endorsement deals a year. Ruth, followed by James Dean, was the most popular client at Curtis Management Group, an Indianapolis firm that markets late "greats" on behalf of descendants (who, in some states, own the rights to their dead relatives' image for fifty years). Curtis's services triggered a trend of resurrected dead celebrities hawking products—through the 1990s Louis Armstrong sipped Diet Coke in television commercials, Groucho Marx danced with Paula Abdul, Fred Astaire pranced with a vacuum cleaner, and Janis Joplin peddled Mercedes Benzes. In 2001 Forbes magazine published a ranking of the earnings of the images of dead celebrities. Heading the list was Elvis Presley, whose estate earned $35 million. He was followed by Charles Schulz ($20 million), John Lennon ($20 million), Theodor "Dr. Seuss" Geisel ($17 million), and Jimi Hendrix ($10 million). Celebrities need not have to generate revenue in order to have their cultural immortality assured. In recent decades over two hundred halls of fame have been founded to preserve the memories of celebrities in sports, the arts, and entertainment. Concurrently, the U.S. Postal Service moved beyond the memorialization of dead presidents and founding fathers to issuing stamps with the images of such deceased celebrities as actresses Lucille Ball and Marilyn Monroe, football coaches Vince Lombardi, and Bear Bryant, and musicians Louis Armstrong and Charlie Parker. Bauman, Zygmunt. Morality, Immortality, and Other Life Strategies. Stanford, CA: Stanford University Press, 1992. Boorstin, Daniel. The Image, Or, What Happened to the American Dream. New York: Atheneum, 1962. Braudel, Leo. The Frenzy of Renown: Fame and Its History. New York: Oxford University Press, 1986. Davis, Daphene. Stars! New York: Simon and Schuster, 1986. "Fame: The Faustian Bargain." The Economist, 6 September 1997, 21–23. Fong, Mei, and Debra Lau. "Earnings From the Crypt." Forbes, 28 February 2001. Forbes, Malcolm. They Went That-A-Way: How the Famous, the Infamous, and the Great Died. New York: Simon & Schuster, 1989. Giles, David. Illusions of Immortality: A Psychology of Fame and Celebrity. New York: Palgrave. 2000. Jaimison, Kay. Touched with Fire: Manic-Depressive Illness and the Artistic Temperament. New York: Free Press, 1996. Kearl, Michael. "Death in Popular Culture." In Edwin S. Shneidman and John B. Williamson eds., Death: Current Perspectives, 4th edition. Mountain View, CA: Mayfield Publishing, 1995. Polunsky, Bob. "A Public Death Watch Fascinates Hollywood." San Antonio Express-News, 8 September 1985, 2–H. Reisman, David. The Lonely Crowd. New Haven, CT: Yale University Press. 1950. Sandomir, Richard. "Amid Memories and Profit, Mantle's Legend Lives On." New York Times, 22 August 1996, A1, B9.